Activities You Must Try While You're in Florida — Kraken Cycleboats - Experience Florida With This Unique Party Boat Experience! For many people, Florida is the perfect destination when you’re in need of sand, sunshine, and relaxation. However, when most people think of Florida, they often think about Disney World and crowded beaches, but there’s so much more that you can explore and experience. If you’re planning to visit our neck of the woods, or the everglades, at some point this year, it’s important to really take some time to experience everything Florida has to offer. In today’s post, we will give you a few ideas of activities you must try while you’re in the Sunshine State. Jacksonville, Miami, and Tampa are popular destinations in our sunny part of the country, and if you’re planning to visit any of these exciting cities, then make sure to book a seat aboard Kraken Cycleboats! There’s no better way to see the city than from the water, and our paddle pub gives you the unique opportunity to have a great time while touring one of Florida’s most popular destinations. 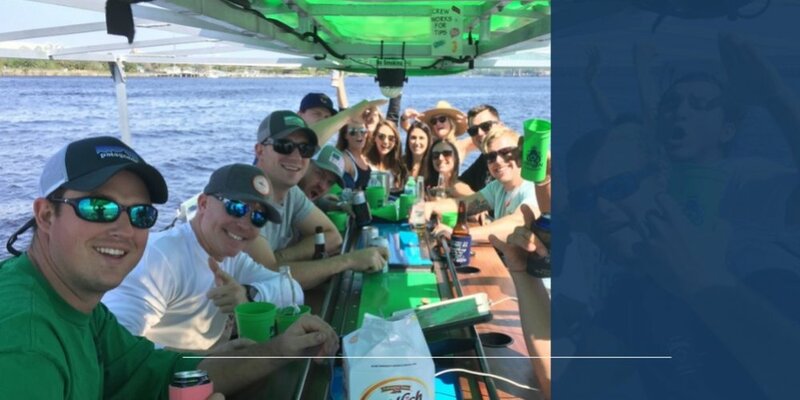 Learn more about this fun and exciting paddle pub tour, and book a reservation with Kraken Cycleboats in Tampa, Jacksonville, or Miami today! The coral castle, also known as “Florida’s Stonehenge,” is located about an hour south of downtown Miami. This gorgeous castle was created using limestone by Edward Leedskalnin, and took more than 28 years to complete. What makes this museum incredible to see is that each piece appears to be created using coral, but in fact is made of a type of limestone called oolite. As you explore the museum, you can view walls, furniture, and more featuring this unique coral-like texture. It truly is a sight to behold. It’s no secret that seafood is always better on the coast, and Florida is no exception. While you’re visiting Florida, it’s important that you eat seafood at least once. Depending on which part of the state you visit, there’s a good chance that the seafood may be a little more on the pricey side, but it’s worth the cost. You can find more than one restaurant serving seafood no matter where you go, whether it’s a small local place on the beach or a well-known chain like Margaritaville. Regardless of where you choose to eat, there’s no question that your Florida trip isn’t complete until you indulge in some delicious seafood. If you want to spend a day at an amusement park, but you want to avoid the crowds in Orlando, take a trip to Busch Gardens in Tampa! There are only two locations for this fun and exciting park in the United States, and if you’re planning to be in the Tampa area, you can experience Busch Gardens for yourself. If you are not someone who enjoys roller coasters, then you can spend the day exploring the rest of the park, going on safaris, and visiting a selection of more than 12,000 animals! Busch Gardens is a great place for your entire family, and it’s a must-see part of your Florida vacation. It can be difficult to find activities that the whole family will enjoy, so if you’re visiting Florida with family of varying ages, the ZooTampa at Lowry Park is the perfect place for you! ZooTampa features six different areas of the park full of all of your favorite animals, including a section that is dedicated specifically to wildlife native to Florida. What makes this park different than other zoos you may have visited is that it gives you the chance to interact with a variety of animals throughout the park. At ZooTampa, you can feed the giraffes and hang out with giant tortoises! See Tampa, Miami, or Jacksonville From the Water! There are countless things to do when you visit Florida, from seeing wildlife to screaming as you zip up and down a roller coaster. However, when you visit Tampa, Jacksonville, or Miami, Kraken Cycleboats is a must-try experience unlike any other. Aboard our paddle pub, you’ll be able to drink, listen to music, and have a great time with your friends and family members! You never need an excuse to have a great time aboard the Kraken, and our paddle pub is definitely one experience you don’t want to miss. Check out our media gallery to learn more about our tours, and reserve your spot in Tampa, Jacksonville, or Miami today!